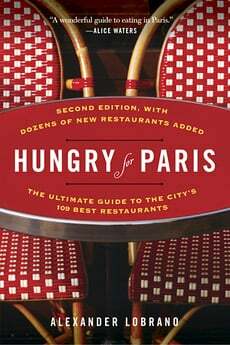 Alec Lobrano has been writing about the food in Paris for over two decades, and was the Paris correspondent for Gourmet magazine. When his book, Hungry for Paris came out, I immediately opened to page one and read it cover-to-cover. He’s one of the best food writers of our generation and each chapter tells the story of one of his favorite restaurants in Paris. And now, as a result, whenever someone suggests a restaurant for dinner, I’ll pull my copy of his book from my shelf and see what Alec has to say before I confirm. We recently dined together on steak frites and I was thrilled when he agreed to write up a guest post with his favorite places for steak and French fries in Paris to share with you. He not only did that graciously, but included notes about what cuts of meat to expect in a French restaurant, which many visitors will certainly appreciate. And for vegetarians out there, he listed a healthy alternative, too! In Paris, Where’s Le Bœuf? According to one of the cordial waiters at Au Bœuf Couronée, one of the last old-fashioned steakhouses in the Paris’s old slaughterhouse neighborhood La Vilette in the 19th arrondissement, they haven’t been so busy in years. Pour quoi? It seems that these trying times have a lot of people craving meat and potatoes, or as the French would have it, steak frites, that infinitely Gallic and profoundly consoling combo of steak with fries or some other form of spuds. If you’re one of them, I’m happy to share my favorite steak frites addresses in Paris (vegetarians please skip to the last paragraph), but first a couple of pointers. Though you see more and more Irish, German and Brazilian beef on Paris menus, the French product is infinitely better in terms of both taste and texture, with the best French beef labeled according to where it was produced. The most common premium labels are Coutenance (Normandy), Charolais (Burgundy), Salers (Auvergne) and Aubrac (Auvergne). (And for the record, the best French beef I’ve ever eaten came from a little town called Bazas in the Aquitaine region. I still remember every morsel because it was so full of flavor and had the perfect texture, midway between tender and nervous; you can try it at the Café Restaurant Indigo, 25 rue Fondespan, Bazas, Tel. 05-56-25-25-52). The most common French cuts of beef are the entrecôte, rib steak, the faux filet, which is roughly equivalent to a sirloin steak, and rumsteak, rump steak. Many Parisians also love bavette, skirt steak, and onglet, flank steak. The two tenderest cuts are the filet and châteaubriand, a thick filet steak, but my favorite is the côte de bœuf, which is a thick on-the-bone rib steak, usually served for two, and full of juice, flavor and texture. This crowded and very popular place is one of my favorite bistros in Paris, and they serve an excellent entrecôte, which is a little chewy as the best ones usually are, and first-rate frites. 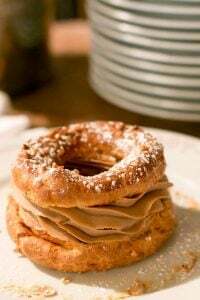 The dark-horse reason to come to this charmer, though, is that they serve the best Paris-Brest (choux pastry filled with hazelnut butter cream) in town. Tel. 01 43 72 24 01. I love the almost somnolent calm of this 1865 vintage restaurant at La Villette, and even though it’s a trek to get here the beef is excellent and the accompanying potato choices make you swoon–the pommes dauphine are crispy nuggets of deep-fried mashed potato and choux pastry with just a whiff of nutmeg, the pommes soufflé, twice-fried potato slices that swell to become round and puffed like a twin pair of the world’s best potato chips but better and the frites are all à tomber par terre (drop dead good). Tel. 01 42 39 44 44. After working as an architect, the owner of this popular bistro near the Bourse, or old French stock exchange decided on a new career catering to carnivores, and now he’s serving up one of the best steak frites in Paris. I find the slightly bawdy atmosphere of Bankers and brokers whopping it up at noon amusing, but you might prefer dinner, when it’s much quieter. Tel. 01 42 60 08 83. When it opened in 1921, this three-level restaurant with a plant-bedecked central atrium and some art-deco allure, was a bouillon, or a place people went for a fast, cheap feed, including its signature pot au feu. With the arrival of new owners Marie and Etienne Gerraud in 2003, the quality has soared but prices remain reasonable, and they now serve excellent oysters, onion soup, œufs mayonnaise and superb Limousin beef. Go for the faux filet or the bavette, both of which come with a small golden mountain of some of the best frites in town. Tel. 01 45 74 03 27. M: La Motte Piquet, Emile Zola or Commerce. I’m not wild about the antic rustic baroque décor of this place, and the 8th arrondissement isn’t my usual stomping ground, but I ignore the fussy cut velvet seats for a chance to tuck into their superb Aubrac beef–the côte de bœuf here is epic, as is the faux filet, and both come with aligot, that irresistible Aubergnat specialty of potatoes whipped with cheese curds and garlic until they have the texture of molten latex. A great address if you’re jet-lagged, because it’s open twenty-four hours a day, seven days a week. Tel. 01 43 59 05 14. Though this little place on the Left Bank has become pricey and the service can get a little perfervid, all will be forgiven when your steak arrives. Owner William Bernet used to work for the Boucheries Nivernaises, one of the best butchers in Paris, and the man knows his meat. I always go for the faux filet and a nice bottle of Vacqueyras. Tel. 01 45 40 40 91. This Left Bank beau monde favorite feels like a rather rarified little club, and it is, but the service is surprisingly friendly and the vieille France food is vastly better than most of what you find in other overtly fashionable Paris restaurants. The filet costs an arm and a leg (€44), but it’s magnificent meat and the accompanying fries are terrific, too. For years, vegetarian restaurants in Paris have been stuck in a sort of 1968 time warp of straggly spider plants in macramé baskets and menus that were more wholesome than delicious. Now Mark Grossman, owner of the popular Bob’s Juice Bar, has opened a casual restaurant that resets the dial with delicious dishes like veggie stew, made with quinoa and garnished with eggplant, pumpkin and sweet potato. The curried lentil galettes are terrific, too, and they serve a great selection of fresh juices. Open Monday-Friday 8am-3p, Sunday brunch 10am-4pm. Thanks to Alec for sharing his favorite addresses! You can visit him at Alexander Lobrano.com, and his diner’s blog, Hungry for Paris. The steak looks delicious and the fries too. Thanks for the tips concerning restaurants. I plan a trip to Paris this spring and a little orientation always helps. Thanks again for this information. I will definitely try one of these recommendations next time I visit Paris. (Hope my very very beginner’s French is able to get me what I want, though!). One thing visitors should be aware of is that French people often like their beef bleu, which translates as “rare” but is usually nearly raw in the center. One could ask for saignant (pronounced: sai-nyant), which is raw-to-medium rare. Or à point (“at the point”), which is near medium. These definitions vary from place-to-place, so it’s best to ask the waiter about the cuisson (how it’s cooked), when ordering. Some places won’t cook beef any longer than that, especially if it’s a place that uses very high quality meat. It’s out of respect for the butcher and the ingredients. 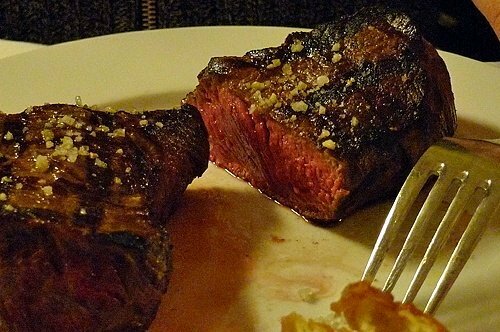 Well-done steak is often referred to as à la semelle, or “like shoe leather” for that reason. La Bourse ou La Vie is great at night, unless the owner is drunk and loudly chatting up the diners…… I’ve been there for that and it was an unforgettable evening…. We live around the corner from the Cafe du Commerce. It’s a great place to go when you’re hungry… in addition to the steak, they do a mean fish, which my husband generally orders while we eat the steak. Their onion soup is first rate also… not to mention the profiteroles – fresh crisp pate a choux, creamy vanilla ice cream and amazing dark chocolate sauce poured at the table! Mmmmmm. I’m drooling. I just bookmarked this page for my next trip to Paris. Thanks for mentioning the metro station nearby; it really helps. ;o) Oh I so want to go to Paris. Hopefully, I’ll be able to make it for Christmas, I check the prices everyday. I remember reading Lobrano when he was writing for that little back Time Out, Paris in English section of Pariscope and have followed his career from afar with interest. I will definitely be picking up this book in preparation for our upcoming trip. What’s a trip to Paris without a good steack-frites??? Thanks for the great suggestions, Alec and David! I have a friend visiting this week, and I’m sure she would love a classic French meal like steak frites. but so many are missing…. UNICO, rue Paul Bert is to die for, their argentinan beef is so tender it’s like butter- and their papas (potatoes wedges) are super yummy. or Le Petit Vendome, or l’Os a Moelle..? going soon. book on the way. Marie: Just watch out for the birds in there! 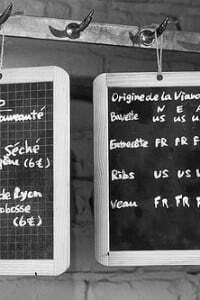 cecile: It’s impossible to name all the great steak frites places in Paris, but I appreciate Alec taking the time to write this up. I haven’t been to UNICO; I’m still missing the 70s-looking butcher shop that it replaced. Black Dog is also pretty fun. Although the steaks aren’t the best, this restaurant tucked into the back of a heavy metal bar is pretty wild. Jackie: In case folks don’t know, you can type an address into Google Maps and it’ll show you a printable map for any address in Paris, which will include the closest métro stops. I think it has a feature where you can type in multiple addresses as well and you can map out your whole trip! Oh man this post makes me just want to hop on the eurostar and come out for a good steak frites my self. It’s one of my favorite meals. David, Thanks for turning us onto Alec’s site! Alec, This is a very informative post, and I’m looking forward to reading more from you! I like your comment about La Bourse, “I find the slightly bawdy atmosphere of Bankers and brokers whopping it up at noon amusing.” I find the same behavior at the steakhouses and bars in NYC amusing too. There must be a common gene in bankers that makes them behave in juvenile ways in public. LOL! I currently started reading your blog and pick up all the tips and recommendations. Cheers for that! btw, I agreed with you on most of the list regarding the patisserie. You mentioned that you went to pastry school in Paris, which one did you go? And you took the whole program as a diploma or you just did a few weeks for professional perfection? I’m currently in Cordon Bleu for the pastry diploma. I was not a professional before. Although I proceed to Superior now, I still feel discouraging doing things now and then because of heaps of failures. Start casting doubts that can I really make it as a career in future? So, I guess he doesn’t think much of l’Entrecôte? Nice write up. Since I am stuck here in Lovely Virginia, USA, it seems I won’t be making it to any of these places anytime soon. :( I guess I can just live vicariously through everyone else. Maybe I’ll hit my butcher up for some grassfed steaks and make some steak frites for myself and family. But, does anyone know where in the US I could find that SEB Actifry? That sounds like quite a cool machine. I did a quick look online and only found sites in french which I cannot read since I failed 8th grade French. (I was too concerned with my girlfriend Amber in that class than learning any French.) All I know is what I learned in culinary school. Alec Lobrano’s book is not only good eating. But, it’s terrific reading. 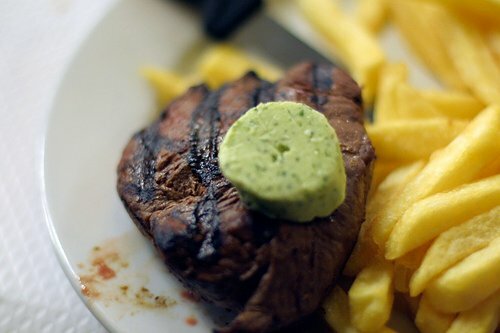 My husband had a steak frites at Le Café du Commerce earlier this year and loved it! Mind you, he’s easy to please – but we did, and do, love Le Café du Commerce, and I recommend it highly. Incidentally, sometimes the menu at the kind of restos I eat in offers a “pièce du boucher”, which sounds like a slice of the butcher, but is actually a steak, and usually very good. Great and timely list! I’m heading to Paris in 3 weeks for a long weekend with my family. I’m wondering if any of the recommended places are friendly for a vegetarian as well? I’m the lone veggie in our party of 5 and I don’t want the rest to miss out on their steak frites, but I don’t want to be stuck with nothing to eat either. It looked like Cafe du Commerce would be a possible option, but I’ve only been able to find menus online for 2 of the recommedations. Or even if anyone has a suggestion not on the list, I’d love to hear it. Thanks!! Rachel: I’d say that if your friends ate fish, there are those options at Café du Commerce and it’d be fine. starman: Alec didn’t mention all the places that one could possibly go, but personally, I like L’entrecôte quite a bit, and would say they have some of the best frites in Paris. And their profiteroles, doused in hot chocolate sauce, aren’t bad either! The Onglet is not a flank steak. In the US it is known as a Hanger steak. Fingers crossed, we’re on our way to Paris in December so I’m hoarding these restaurant recommendations like a fiend! The only thing that scares me is trying to make a reservation in my very (make that extremely) limited french. Any tips on how to do that? Trying to train to run the Paris marathon in April – never been to Paris or Europe or anywhere for that matter except the back of a kitchen – will let you know if I make it with training – will you be in Texas this year? 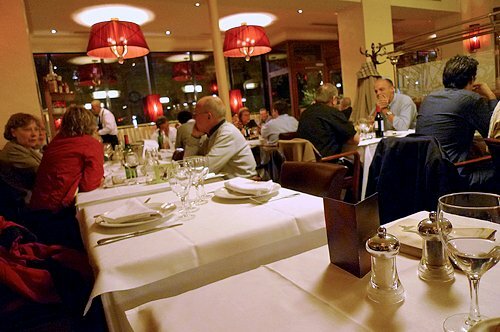 suzieq: A good many of the restaurants in Paris have someone on the staff that speaks some English. The standard reply is usually, “A little”, which they say because they want you to speak slowly and clearly. You can also ask at your hotel to call for reservations. Speaking of which, even if a place isn’t busy, most restaurants in Paris like it when you reserve first, and you’ll get a better reception if you do. In other places, they’ll take folks who walk in, but in Paris, they like to know who is coming. And if you do walk in and see empty tables and they can’t seat you, it’s generally because those tables are reserved and it’s uncommon in Paris to turn tables quickly, as they do elsewhere. The steak tartare I had at Cafe du Commerce on Saturday night was impeccable. That’s a dish I wouldn’t dare order in the States but this was really high quality, and Le Commerce isn’t a fancy place. The crisp frites and the frisee aux lardons starter were the perfect accompaniment to a real carnivore fix. Another treat is steak–or anything, really–with the incredibly luscious braised shallots shown in your fourth photo. I just got back from Paris (literally, two hours ago) and cannot thank you enough for your recommendations while we were there! We especially loved Rubis and Le Nemrod (the Croque Poilane was to die for). Since we were staying in the 20th, near Gambetta, we had dinner one night at Chantefable, based on someone else’s review on your blog, and their steak frites was very good (and ENORMOUS)- I am no expert, but I would give it a try if you have not already. Alec, while I may not be using the restaurant suggestions any time soon, I will be using your wonderful line ‘midway between tender and nervous’. I live in a place where I have to know who is cooking if a request for rare means I’ll get medium well. My father used to call our preference ‘flip flop moo’. By the way, I’ve always thought that a place where you’re not asked how you want the beef when you order a steack is not a good place at all. The advice and translation about the medium/rare/well done question is really usefull, and I would add that english customers need to be prepared to be asked this question in good restaurants. Hi david, thanks for sharing your thoughts. It’s definitely not an easy career , but will try my best to see how it works. BTW, crossed over one of your blogs about Exceptions Gourmandes in Le Marais. It’s still there with the Nougat and Financier, also the Glaces. But Chef Philipe Conticini has left and opened his new boutique in Rue Du Bac – Le Patisserie des Reves. It’s been there just 2 months, but already a lot of buzzes around it. I went there yesterday, but it closed on Monday. I am DROOLING over that piece of meat. It reminds me of my Buenos Aires days where good steak was abound – yummmm. Thanks, David. Unfortunately I don’t eat fish. Eating out in Paris would be easier if I did. :-) I usually don’t have much of a problem when I’ve traveled on my own or with friends, but the family wants their steak-frites… I might just need to let them go off on their own and hit up L’As du fallafel by myself as I’ve not tried them yet. L’As du Fallafel is wonderful, and you should definitely make your way there. Thanks for the great suggestions, will definitely keep this in mind on our next Paris trip. Something so comforting in steak and frits and it just taste different in Paris than anywhere else! I would pick steak/frites as my last meal. And I have never had better ones than in Paris. Thanks for offering new options! Thank you so much for sharing this information. I have lived in Paris for a 2.5 years now and I have eaten more meat in these past 2.5 years than I have in my entire life of 30 years. But then I am Asian and meat is a side dish for us. I really love Bistrot Paul Bert. Their cote de beouf is absolutely the best meat that I have ever had. For some reason they took it off the menu in the early spring and just 2 days ago I went there to ask them when they will have it again. They just said depends and that I can get the entrecote. But I said “c’est pas le meme gout”…tant pis. Now armed with your list and your blog, I will find some other alternatives until the cote de beouf comes back to Paul Bert. Their seafood restaurant next door is beyond fantastic. very cool site, jumped here from Times Online Top 50 Food Blogs. can be akin to finding a needle in a haystack, really. Oh, my. You make the carnivore in me roar with approval. From what you say, perhaps in France I shall find meat rare enough for me! Most restaurants in the US don’t serve it the way I like it, i.e. almost still with a pulse. These photos are mouthwatering. I need to go to Paris NOW. Oh David, how could not include Relais de l’Entrecote? I think there are a couple of locations, but I always go to the one on rue Saint-Benoit, across from Petit Zinc and behind St. Germain-des-Pres. The sauce, the desserts, the vibe. I love that place. Thanks for your amazing restaurant recommendations and beautiful photographs! Anyone who likes cote de boeuf should try La Mercerie on rue des Canettes near St. Sulpice church. 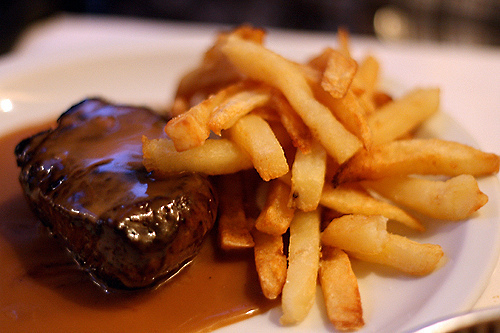 It is my husband’s favorite dish in all of Paris and is charred and salty on the outside, while tender and juicy on the inside, and the fat steak fries are perfect.